Nice work. Gotta get this done sometime soon with the JDM H22 before I play with it. Gives me a baseline. Whats the closest to Springvale/Mulgrave? Last edited by Baz; 14th February 2013 at 05:37 AM. Forged engine decompressed to 9.0:1 CR, FMIC, K&N Pod, 2871R turbo, simple manifold, 2.5" mandrel bent from turbo to tip. Anything thing I say is my opinion, all care, but no responsibility taken. You might need some aero stat! How many pounds of boost can the motor handle?? It all depends on the flow of the turbo. 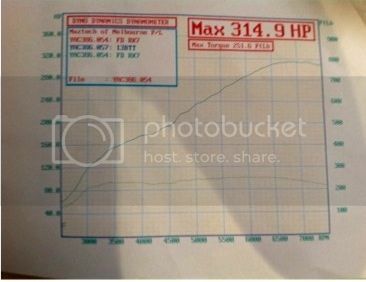 I ran 10psi into the stock motor with the old turbo, this turbo at 10psi probably would have killed it. This bottom end of this engine is built to handle more power than the top end will flow. The ARP main studs would probably snap or tear out of the block before my rods would bend. Yeah... Usually the turbos go first . Same for me. The highest safe boost for my stock blowers is 14psi. 16psi would probably kill my twins! My donk can cope with a fair bit more though!!! Other Relevant mods: Hondata S300 V2 with Hondata boost control + more.